This template will find locations, persons, or businesses associated with a list of phone numbers. You'll also identify the reputation score of each number and if it's on a do not call list. 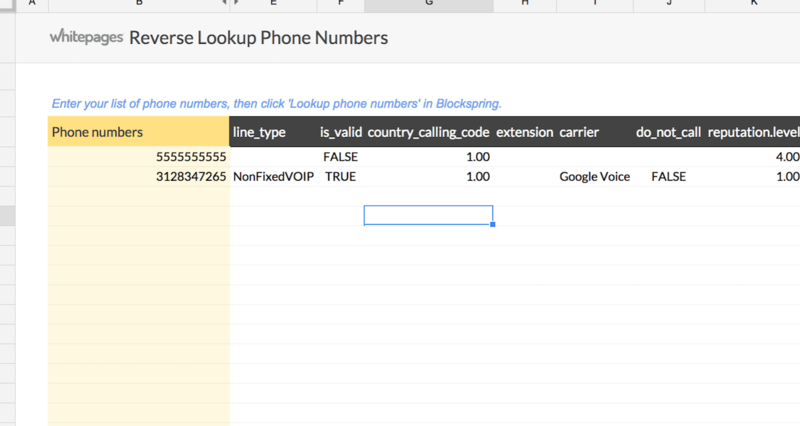 This is great for data enrichment and validation if you have a list of phone numbers sitting in a CRM or spreadsheet. This template will process about 1000 phone numbers each time you run it. If you're on a production Whitepages plan, please contact support@blockspring.com and be able to increase that limit.